Could CVS become the Genius Bar of health care? On Monday afternoon, the wait at a CVS MinuteClinic in Porter Square was about an hour and 15 minutes. A day after announcing the $69 billion deal, leaders of Woonsocket, R.I.-based CVS and Hartford-based Aetna said they would test ideas to expand services at CVS locations, with a particular focus on people with chronic conditions such as diabetes. The executives said CVS could help patients adhere to their care plans and keep their diseases under control by providing blood tests or nutrition advice, for example. “We plan to build an entirely new health care concept,” Larry J. Merlo, chief executive of CVS, said Monday. The strategy puts CVS more squarely in the path of traditional facilities run by doctors and hospitals. Analysts said there are many questions about how the transaction with Aetna would play out, and whether patients and consumers would embrace the company’s new offerings. Zack Cooper, assistant professor of public health and economics at Yale University, said he was excited by the prospect that CVS and Aetna could work together to innovate in health care. “My hope is, with 10,000 brick-and-mortar locations, they’re going to offer different models. The hope is that that will make care more efficient,” Cooper said. “The challenge is, that’s the part that’s more speculative and is going to be way, way harder to achieve,” Cooper added. It remains to be seen whether expanding health services at CVS locations would help lower costs. A major selling point of walk-in clinics such as those operated by CVS and other companies has been that they will help reduce hospital emergency room visits by giving patients a lower-cost and more convenient place to go for minor problems. But some studies have shown that retail clinics such as those operated by CVS, Walmart, and Target may actually add to overall health care spending by encouraging patients to seek treatment for problems they previously would have managed on their own. “While the care itself at a retail clinic may be cheaper . . . most of the visits represent new utilization and therefore increased health care spending,” said Dr. Ateev Mehrotra, an associate professor at Harvard Medical School who has studied the issue. CVS also faces hurdles in persuading people with chronic diseases to start seeking services where they pick up their medications (along with shampoo and makeup). So far, CVS’s 1,100 walk-in clinics nationwide mostly have drawn healthy people who need help with routine medical issues, Mehrotra said. 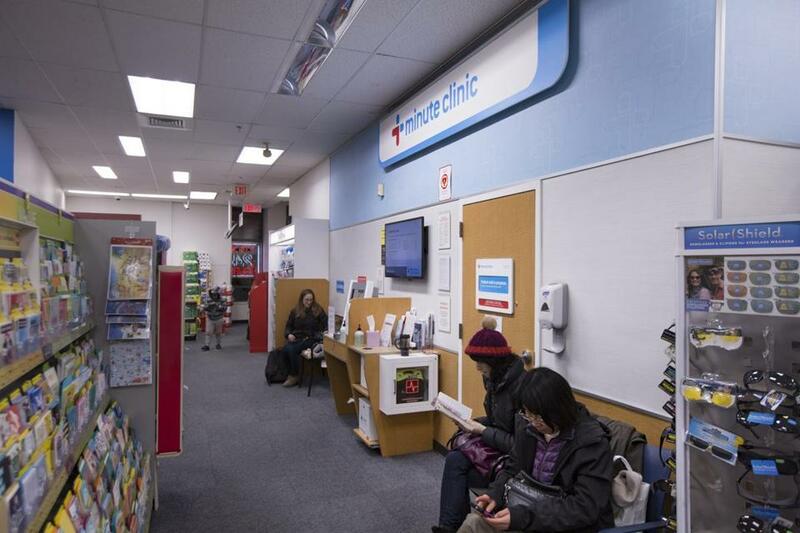 CVS began adding retail clinics to its stores several years ago, acquiring the MinuteClinic brand in 2006. Currently, the clinics are staffed with nurse practitioners and physician assistants, offering treatment for minor infections and skin conditions, providing physical exams and vaccinations, and delivering other basic services. Then-Mayor Thomas M. Menino of Boston led a campaign in 2008 to block CVS MinuteClinics from opening in the city, arguing that the quality of care would suffer at for-profit clinics. CVS continued to open clinics in other Massachusetts communities. And other for-profit companies, recognizing the demand for health care services in more convenient settings, began setting up urgent-care clinics. Traditional providers have seen these walk-in clinics as competition. Some have responded by opening their own walk-in locations, expanding hours, or taking other steps to become more consumer-friendly. CVS and Aetna, whose deal still needs approval from federal regulators, did not detail what their expanded health care offerings would look like. Dr. Henry L. Dorkin, president of the Massachusetts Medical Society, said the CVS-Aetna transaction presents the potential for greater access to medical care. But he said that care must be coordinated with primary care doctors to ensure patient safety. “Procedures must be put in place that make patients aware that limited-service clinics should not be viewed as a medically appropriate substitute for a relationship with the primary care physician, especially for those who are being treated for chronic disease,” Dorkin said in a statement Monday. Benjamin Gomes-Casseres, a professor at Brandeis University’s International Business School who examines corporate mergers, balked at the suggestion, made by Aetna’s chief executive, Mark T. Bertolini, that going to CVS might one day feel like shopping at an Apple store. Dr. Shannon Monnat, the Lerner chair of public health promotion at Syracuse University, said the merger may lower costs by increasing access to timely, more affordable care. But she cautioned that the potential downside is that it could contribute to the “tremendous disparity” in the health care system. “There is the potential that these clinics would be a low-quality health care dumping ground for poor and vulnerable populations,” Monnat said. Ingrid Lindberg, a longtime health care consultant who is now president of the customer experience firm Kobie Marketing, said the proposed clinics have a distinctive edge in that they will rely on pharmacists and nurses — professions consumers trust more than any other in health care, according to Gallup polls. And they have lower salaries than doctors. At CVS in Porter Square on Monday, six people were waiting to meet with a MinuteClinic provider. The wait was one hour and 15 minutes. A customer, Zarrin Foster, 62, said CVS’s effort to make health care more accessible was important, especially for working families with children. Globe correspondent Natasha Mascarenhas contributed to this report. Priyanka Dayal McCluskey can be reached at priyanka.mccluskey@globe.com. Follow her on Twitter @priyanka_dayal. Janelle Nanos can be reached at janelle.nanos@globe.com. Follow her on Twitter @JanelleNanos.